We’d love your help. 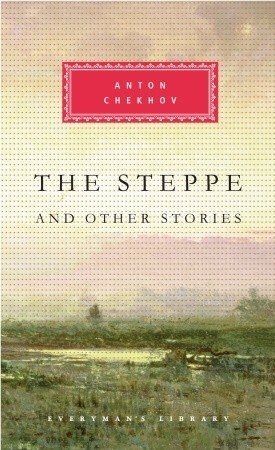 Let us know what’s wrong with this preview of The Steppe and Other Stories by Anton Chekhov. To ask other readers questions about The Steppe and Other Stories, please sign up. Ο τρόπος που ο εγκέφαλός μας χρησιμοποιεί στα όνειρα για να αποδώσει τον Χρόνο είναι ο Χώρος, προκειμένου να "μεταφράσει" υπό μορφή εικόνας το αόριστο, το απροσδιόριστο. Η Στέπα, στο εμβληματικό αυτό κείμενο του Τσέχοφ, είναι μια τεράστια έκταση χώρου που εντός της περικλείει άπαντες τους ανθρώπους και τον χρόνο τους: Μικρές, ταπεινές ζωές μουζίκων, ανθρώπων κατατρεγμένων που οι πεπερασμένες υπάρξεις τους περιδινούνται σαν τα φύλλα μέσα στο αδιάφορο για τα ανθρώπινα πεπραγμένα τοπίο της. Ήρωες-σ Ο τρόπος που ο εγκέφαλός μας χρησιμοποιεί στα όνειρα για να αποδώσει τον Χρόνο είναι ο Χώρος, προκειμένου να "μεταφράσει" υπό μορφή εικόνας το αόριστο, το απροσδιόριστο. Ήρωες-σύμβολα, ο έμπορος, ο παπάς, οι μουζίκοι και φυσικά το παιδί (που αποτελεί τη "σπορά" για ένα καλύτερο μέλλον) ακολουθούν τις προδιαγεγραμμένες διαδρομές τους μέσα στο αυστηρό τοπίο, σε μια αλληλοδιαδοχή εικόνων και καταστάσεων, επιτελώντας αυτό που επιτάσσει το καθήκον και η κοινωνική τους θέση. Γενναίοι και δειλοί, νοήμονες και ανόητοι, ευγενείς και πληβείοι, καλοί και κακοί, ονειρεύονται και ζουν τη ματαίωση, ενώ σε κάθε βήμα τους παραμονεύει μια υπενθύμιση: "memento mori"! Το νεκροταφείο του επόμενου χωριού, ένας τάφος στον δρόμο… και η αείποτε Στέπα. Σίγουρα η πρώτη μου επαφή με το λογοτεχνικό έργο του Τσέχοφ δεν θα είναι και η τελευταία. A little boy leaves his home and first time he finds himself face to face with the huge outside world and people that live there. He is sad and full of child’s fears and sorrows and a new unknown life lies ahead. Chekhov masterfully describes boy’s feelings and his experience of the journey and his pictures of nature are brilliant. And The Duel is florid portrayal of provincial living: deadly boredom and stagnation, wicked gossiping and envy. And the hostility of two main characters turns into an acidic travesty. “A silence followed. Boyko took a pair of pistols out of a box; one was given to Von Koren and one to Laevsky, and then there followed a difficulty which afforded a brief amusement to the zoologist and the seconds. It appeared that of all the people present not one had ever in his life been at a duel, and no one knew precisely how they ought to stand, and what the seconds ought to say and do. But then Boyko remembered and began, with a smile, to explain. Si yo hubiese empezado a Chéjov por el teatro lo habría odiado, así os lo digo. Creo que es necesario entender el contexto sociocultural de Chéjov y la dinámica de sus historias. Y, bajo mi punto de vista, es más fácil hacerlo a través de sus cuentos que a través de sus obras de teatro. Por supuesto, eso no significa que considere el teatro de Chéjov menos relevante que su narrativa. Hace unas pocas semanas pude adquirir un volumen que venían dos relatos. La verdad es que me sentí atraída sobre todo por el título La estepa. Hacía tiempo que quería leer algo que no estuviera ambientado en Moscú o San Petersburgo, y con esta publicación acerté de pleno. Ambas historias, tanto La estepa como Historia de un provinciano, están ambientadas en el complejo mundo rural ruso. Por una parte, La estepa me pareció una obra con mucha sensibilidad. La historia está narrada en tercera persona y el protagonista es un niño de ocho años llamado Gregori (Egor o Egorushka). El niño va a ingresar en una escuela de formación muy lejos de la ciudad donde vive con su madre y con su tío. Aprovechando una venta de lana, el tío de Egor se lo lleva a la escuela de formación. Y la historia, básicamente, nos relata el viaje de Egor, su tío y el padre superior de la Iglesia de San Nicolás. Como podéis esperar, sí, abunda la descripción. Era lo que yo buscaba, es decir, quería un relato que me hiciera sentir en la estepa. Y Chéjov lo consiguió ampliamente. La descripción es pura lírica, muy delicada. Pero la maestría no reside en esto tan solo. Chéjov muestra de forma muy bien escogida los elementos para que con una descripción de un par de páginas te sientas entre las avefrías. Es una historia emotiva, dulce y sencilla que deja una placentera sensación en el corazón. No hay otra forma de resumir mis sentimientos. La otra historia, Historia de un provinciano, no es la biografía de Chéjov. Y digo esto porque Historia de un provincianoes el subtitulo de el relato, que en realidad se llama Mi vida. A pesar de lo dicho, algunos paralelismos si habremos de encontrar. El padre cruel, por ejemplo. El padre que pega a sus hijos incluso estos siendo ya bastante adultos. El protagonista a veces recuerda al propio Chéjov en el carácter sosegado y pensativo, incluso su forma de concebir el matrimonio. El relato está muy bien pensado, no le falta de nada. Tiene todo lo que les falta a Dostoyevski y a Tolstói en la narrativa breve: un ritmo estable, claridad y concisión . Tiene todo lo que le falta a Gorki: que la ideología del creador no subyazca bajo las palabras. Así solo te quedas con experiencias humanas, que es al final la verdadera razón por la que leemos historias. 'The Steppe' is an example of a story that has no major incidents. It mentions the story of a small boy being taken to school in another city by his uncle and his uncle's friend. I could not locate a 'peak' which the event ascend to. However, the way Checkhov describes the scenery of nature and the natural visuals that they encounter is just amazing. And the way in which he describes the stillness and vastness of the steppe is just so relaxing and so soothing that it makes your hear beat gos s.... 'The Steppe' is an example of a story that has no major incidents. It mentions the story of a small boy being taken to school in another city by his uncle and his uncle's friend. And the way in which he describes the stillness and vastness of the steppe is just so relaxing and so soothing that it makes your hear beat gos s.....l.....o.....w! The edition I have read if this is the Everyman Millennium Project version with The Steppe as its main story and then eight other shorter works, a few of which I had previously read, in it. It contains The Kiss, which is rather good ands have, along with the title story, is considered to be an advance on the others, which are early writings in the career of the prolific and prodigious talent. The Steppe itself is a road story, travelling a long way in the minds of its constantly growing cast of The edition I have read if this is the Everyman Millennium Project version with The Steppe as its main story and then eight other shorter works, a few of which I had previously read, in it. It contains The Kiss, which is rather good ands have, along with the title story, is considered to be an advance on the others, which are early writings in the career of the prolific and prodigious talent. The Steppe itself is a road story, travelling a long way in the minds of its constantly growing cast of characters. It has a feel of a panorama about it, although the narrative thrust is pretty much the travels and travails, rather than any lit match on a firework. I enjoyed it but for the 140 page investment a bit more drive would have helped me to love it more. The chapter on inn murders is the stand out one for me. The Swedish Match is an entertaining murder mystery with a twist in the tale - quite an unusual one, which makes it witty and enjoyable. Mire is a black tale of usury, lampooning the ruling classes for their corruptability. It reminds a little of scenes from the later An Inspector Calls by Priestley. It too has an ironic wit that sits well with the otherwise serious tone. the exact title of my book is (the steppe and early stories)but i couldn't find that version on goodreads. there is about 40 short stories in this book, they are the first writings of chekhov in the weekly and monthly newspapers. at 1880 in the era of assassinating of alexander the cesar, there was restrictions on the media but chekhov has to write under those restrictions because it was his only way to provide money for him and his family so that circumstances made him write pointless stories an the exact title of my book is (the steppe and early stories)but i couldn't find that version on goodreads. there is about 40 short stories in this book, they are the first writings of chekhov in the weekly and monthly newspapers. at 1880 in the era of assassinating of alexander the cesar, there was restrictions on the media but chekhov has to write under those restrictions because it was his only way to provide money for him and his family so that circumstances made him write pointless stories and the goal was to entertain and make the reader laugh. those short stories give an image for the russian public life with love and compassion to the poor person. actually the two stars that i gave for this book is only for those short stories and i can't judge chekov's writings by what i mentioned previously in his situation for the money need and for the restrictions the country was under. they can draw a light smile at your face but you can feel that you are wasting your time while reading them but you can't skip the book. you can't imagine how was the struggle by reading those words, and the joy when flipping the page knowing that i finished a damn boring page. picturing the steppe and the valley of the road for a boy who want to reach his school with the company of his uncle and a priest, what a pointless miserable novel..
Что тут комментировать, гениальный Чехов, гениальные повести и рассказы. Читать надо не рецензии, а самого Чехова. "Степь" -- ярчайшая повесть о Малороссии конца 19го века, прочитаешь и как будто сам побывал. Жаль, что не включена в школьную программу. Dramatic, concise, and thought provoking. These characters face dilemmas that we find in reality; they make the reader reflect on matters such as love, death, and existence. Excellent. Nice prose and interessting characters. Russian culture is so different from what i am used too, so this was a very interessting peak into the history of old mother Russia. Chekhov's mastery of the human condition is phenomenal. It is the first time I read Anton Chekhov and even read Russian Classic literature. I believe it's the first time that I rate a short story book 5 stars, usually it's only 3 stars. This book is composed of 3 short stories representing 3 different stages in the life of the author. The first short story (160 pages) is based on the early life of Anton Chekhov, who had to travel a long distance to attend school. This story is about that trip taken with his uncle and a priest from one town to another It is the first time I read Anton Chekhov and even read Russian Classic literature. I believe it's the first time that I rate a short story book 5 stars, usually it's only 3 stars. This book is composed of 3 short stories representing 3 different stages in the life of the author. - the 'road people' share a common experience and fate while together on the road. They might share to each other other people's stories and/or stories of their previous lives, but they don't share their feelings, their fears, and their emotional status to each other. The character wore the same faces throughout the trip never revealing their true selves. This short story was very well written in all its aspects. A must read. - the second patient, Gomorov, had suffered severe and extreme social downfall despite having received an education. The best part of this story is of course the dialogue between the doctor and Gomorov, representing and confronting the philsophies of Chekhov and Tolstoi. This is also a must read short story. The last short story is only about 20 pages long written toward the last years of the author as he's been sick several times. It is a about the last days of a Bishop whose death goes unnoticed. The story is average and too short to be interesting. I love Russian literature but had not got round to Chekhov until I read this book - what a treat. Chekhov is not a grand or showy writer. If you read about his personal life, you will find that he was not particularly fond of being the centre of attention and his stories reflect that. His stories deal with the intimate aspects of human life in language that is clear and lucid. His stories are not about princes and counts, he is not writing short versions of War and Peace but trying to depict the I love Russian literature but had not got round to Chekhov until I read this book - what a treat. Chekhov is not a grand or showy writer. If you read about his personal life, you will find that he was not particularly fond of being the centre of attention and his stories reflect that. His stories deal with the intimate aspects of human life in language that is clear and lucid. His stories are not about princes and counts, he is not writing short versions of War and Peace but trying to depict the ordinary life of normal individuals. Another reviewer has dismissed The Steppe as a boring and pointless story. It seems to me that this is a profound misjudgement of the story; true, it is without incident of note, there are no sword fights or spells cast, but what could possibly more daunting or exhilarating than a young boy's first journey without his parents? The steppe,with its wide open spaces and miscellany of characters seems to me be a metaphor for life itself - vast, mysterious, beautiful and terrifying all at once. In my view a remarkable story. My own personal favourite is The Name Day Party. A beautiful, tragic depiction of the difficulties of married life and the superficiality of position and privilege. At once angry and tender, this is a beautiful work. This review has been hidden because it contains spoilers. To view it, click here. The Steppe is the fascinating tale of young Yegorushka travelling through the interminable Russian steppe to reach his boarding school. Yegorushka travels with his uncle and his uncle's friend and, for the latter art of the journey, with a convoy of merchant wagons. Whilst in the midst of his expedition, the young kid witnesses all facets of the Steppe, from the lackluster summer mornings to the ferocious storms of the night. The story ends with Yegorushka being dropped off at a family's friend The Steppe is the fascinating tale of young Yegorushka travelling through the interminable Russian steppe to reach his boarding school. Yegorushka travels with his uncle and his uncle's friend and, for the latter art of the journey, with a convoy of merchant wagons. Whilst in the midst of his expedition, the young kid witnesses all facets of the Steppe, from the lackluster summer mornings to the ferocious storms of the night. The story ends with Yegorushka being dropped off at a family's friend house, ready to start high school. Reading great authors in translation is always frustrating; the authentic auctorial voice is lost, together with all potential delight one might have taken in the play of language itself. Stylists, of course, suffer more in translation than writers for whom the story or subtext is more important than the way the tale is told. Chekov was a stylist. Still, something comes through, especially in his descriptions of nature. Some of the stories here are very good, particularly 'Easter Eve', 'The Kiss' Reading great authors in translation is always frustrating; the authentic auctorial voice is lost, together with all potential delight one might have taken in the play of language itself. Stylists, of course, suffer more in translation than writers for whom the story or subtext is more important than the way the tale is told. Chekov was a stylist. "Vasya also looked in the bucket. His eyes became unctuous, and his face became tender, as before, when he saw the fox. He took something out of the bucket, put it in his mouth, and began to chew. A crunching was heard. 'It's not a gudgeon, it's a goby,' Vasya a replied calmly, continuing to chew. It looks like goodreads doesn't have the exact edition that I read. I did read "The Steppe and Other Stories"... the Everyman's Library cloth edition. However, it didn't have the same stories that are listed in the description here. Mine had The Swedish Match, Easter Eve, Mire, On the Road, Verotchaka, Volodya, The Kiss, Sleepy, and The Steppe. It was translated by Constance Garnett. Some of these stories I've read before, and some were new to me. This was the first time I have read The Steppe, a It looks like goodreads doesn't have the exact edition that I read. I did read "The Steppe and Other Stories"... the Everyman's Library cloth edition. However, it didn't have the same stories that are listed in the description here. Mine had The Swedish Match, Easter Eve, Mire, On the Road, Verotchaka, Volodya, The Kiss, Sleepy, and The Steppe. It was translated by Constance Garnett. Insignificant, I know, but my copy - in Romanian translation - has 500+ pages, so it probably contains different or at least more stories. The Steppe is obviously the best known, the longest and the most acclaimed. I wasn't blown by it; I'm not much of a fan when it comes to describing landscapes, but I enjoyed its lyricism nevertheless. I preferred A Nervous Breakdown for its implacability and fine portrayal of Vassilyev, plus many other short & funny ones. This was recommended to me but I didn't like it. OK, I get that it is supposed to be dark, brooding and depressing but it's not for me. Perhaps if you are a bit of a depressive person who drinks whiskey late into the night and listens to The Smiths this would be right up your street. Tan variado como su clima y su pueblo; pasando por esos cálidos destellos de verano hasta la oscuridad total invernal; las situaciones de los personajes son de lo más variado, no así la locura y la miseria que se filtra por los entornos y nos deja ver la crueldad humana y sus situaciones enmarañadas, evidenciando las carencias de la cultura actual. Es innegable que Chéjov es un genio. El genio de la brevedad, la descripción fugaz al pintar ambientes, el genio de las muecas que nos dejan, al acabar el relato con una extraña sonrisa melancólica en la boca (efecto secundario del doble significado en sus narraciones). Anton Pavlovich Chekhov [Russian: Антон Павлович Чехов] was born in the small seaport of Taganrog, southern Russia, the son of a grocer. Chekhov's grandfather was a serf, who had bought his own freedom and that of his three sons in 1841. He also taught himself to read and write. Yevgenia Morozova, Chekhov's mother, was the daughter of a cloth merchant. "When I think back on my childhood," Chekhov r Anton Pavlovich Chekhov [Russian: Анто́н Па́влович Че́хов] was born in the small seaport of Taganrog, southern Russia, the son of a grocer. Chekhov's grandfather was a serf, who had bought his own freedom and that of his three sons in 1841. He also taught himself to read and write. Yevgenia Morozova, Chekhov's mother, was the daughter of a cloth merchant. Chekhov's first book of stories (1886) was a success, and gradually he became a full-time writer. The author's refusal to join the ranks of social critics arose the wrath of liberal and radical intellitentsia and he was criticized for dealing with serious social and moral questions, but avoiding giving answers. However, he was defended by such leading writers as Leo Tolstoy and Nikolai Leskov. "I'm not a liberal, or a conservative, or a gradualist, or a monk, or an indifferentist. I should like to be a free artist and that's all..." Chekhov said in 1888.